Will I see private trips on the river? A GCW boat passes a private trip in the background. Chances are, yes! 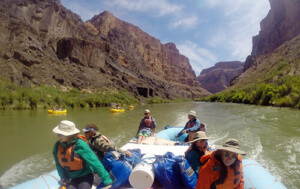 Boating on the Colorado River in Grand Canyon National Park comes down to two options: You can do a commercial trip (with an outfitter like us) or you can do a private trip. To do a private trip you need to apply though the National Park in their weighted lottery system. Getting you number pulled in this system could take up to 10 years! Most of the private trips are oar powered and they have up to 25 days to get from Lees Ferry to Diamond Creek (whereas we usually take 13 days in an oar boat). Generally the private trips have less people that our commercial trips so they tend to overnight in the smaller camps along the river’s edge and to leave the bigger campsites to groups like ours. The other big difference between private and commercial river trips is the schedule. We are limited to rafting from April through October, but folks who pull a private permit can raft year round. If you do see a private trip on the water make sure to say hi!